Fairchild was showing off three USB3.1 related chips at the Qualcomm summit, all useful for Type-C. If you are wondering what is delaying Type-C, other than Skylake, the answer is in the ecosystem. 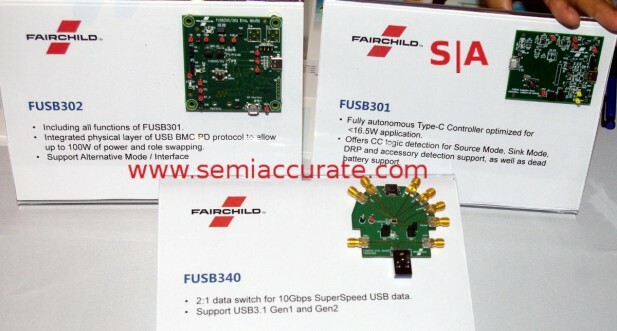 The three new chips are called the FUSB301, FUSB302, and FUSB340 but none actually do much with USB data signals. The first two, 301 and 302, are about power delivery. If you can’t tell from the name, the 340 is a 2:1 10Gbps USB3.1 switch. Actually there is also a FUSB301a that adds I2C address signaling but we will ignore that for now. The reference design boards look like this. Starting out with the FUSB301 we have a controller that does all the functions of USB, control, connection detection, and most importantly power delivery. Since it is standard USB3.1, it will deliver up to 16.5W via the connection. 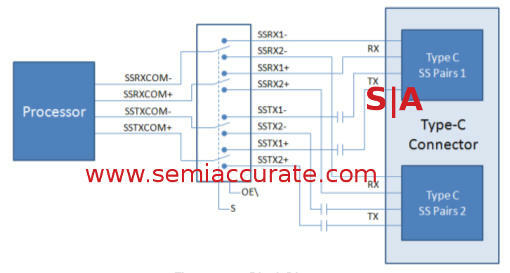 The USB data is sent from the host CPU, the 301 only does the housework, connection management, and device detection. Stepping up to the FUSB302 brings a big leap in power delivery because it adds USB-PD2 v1.1 support. That means this little device can handle up to 100W of power, not a trivial ask for such a small chip. Better yet the 302 can handle alt-modes and role swapping. That last one is a tricky bit for a controller, going from charging a laptop through a port to sending power out the same port to run a device is not trivial to do safely and reliably. The last one is a bit of a head scratcher without the diagram above, the FUSB340 2:1 USB3.1 Gen2 10Gbps switch. Why do we need a switch like this? USB-C is a reversible connector but the pin functions are rather curiously not symmetrical. If you want the functions supported by the cable to be as reversible as the physical plug, you need logic behind the port. That logic would be a 2:1 switch like the one shown above. In case you haven’t guessed, if your USB-C port works as intended, there is probably a FUSB340 or similar device behind it. No Macbook jokes, we know what crap it is under the hood.